The mechanical Differential Analyser has intrigued mathematically minded Meccanomen for many years, ever since this machine was first modelled, largely in Meccano, by Douglas Hartree and Arthur Porter at Manchester University in 1934. Many full scale non-Meccano Differential Analysers were built in USA, UK and Europe between 1934 and the early 1950s, until they were eventually replaced by faster digital computers. 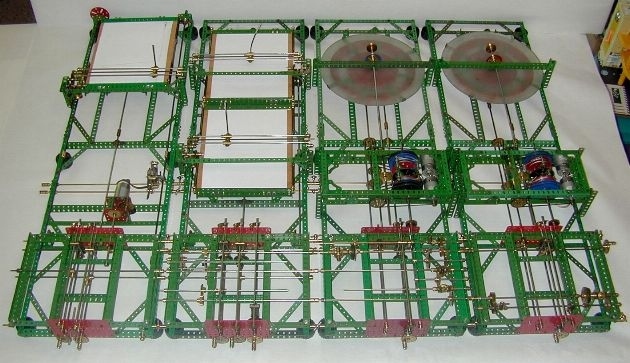 The unique aspect of the Meccano Differential Analyser was that it was accurate enough for the solution of many scientific problems, and much cheaper to build. It is estimated by Garry Tee of Auckland University that about 15 Meccano model Differential Analysers were built for serious work by scientists and researchers around the world. Very few of the original Meccano model Differential Analysers have survived. In fact I know of only two. The first is part of the original Meccano Differential Analyser no. 1 built by Hartree and Porter at Manchester, which is currently displayed in the Science Museum in London (see fig. 1 below). The second is right here at the Museum of Transport and Technology (MOTAT) in Auckland, New Zealand, and consists of the entire Meccano Differential Analyser no. 2 built by J.B. Bratt at Cambridge University in 1935. This machine was last displayed at MOTAT in the seventies and early eighties. It has recently been restored for display purposes and has been on public display at MOTAT again from April 2009. The early Meccano model Differential Analysers were not built entirely of Meccano. The integrator discs were ground glass, and various other parts such as the torque amplifier drums were separately manufactured. Indeed it was considered that a reliable torque amplifier could not be built entirely out of Meccano parts! This has been disproved several times over the years by dedicated Meccanomen. Tim Robinson of California, USA, has perfected the Meccano Differential Analyser to a high accuracy using Meccano parts only, except for the ground glass integrator disc and cord for the torque amplifiers. The picture above is an early example of Tim’s work, and shows what can be achieved in pure Meccano. The other branch descends from the graphic solution of problems achieved by ancient surveyors. Analogies were assumed between the boundaries of a property and lines drawn on paper by the surveyor. The term “analogue” is derived from the Greek “analogikos” meaning by proportion. There have been many analogue devices down the ages, such as the nomogram, planimeter, integraph and slide rule. These devices usually perform one function only. When an analogue device can be “programmed” in some way to perform different functions at different times, it can be called an analogue computer. The Differential Analyser is such a computer as it can be set up in different configurations, i.e. “programmed”, to suit a particular problem. 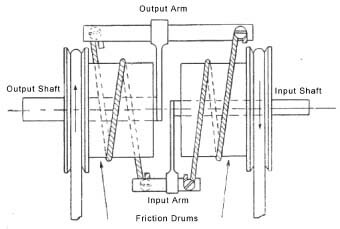 Motors are required for each torque amplifier, and one motor is required for the main input drive. Secondary inputs are manual via the input table. Tim Robinson’s fine model above gives the reader a general idea of a typical set-up. I have purposely not gone into any mathematical background here. Suffice it to say that the Integrators, Input and Output tables, Adders and Counters if required, are all linked together by gearing and shafting to suit the particular differential equation solution required. This requires a lot of effort in setting up for each different problem and is in effect the “programming” of the machine which defines it as a computer. Of course a thorough knowledge of the mathematics of the problem is required by the user. Lead photograph courtesy of Tim Robinson. Other diagrams are by William Irwin. 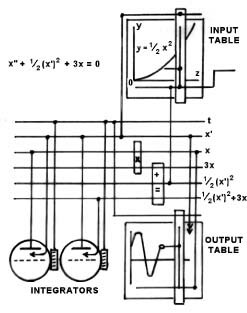 Fig 4 illustrates the differential analyser in diagrammatic form set up to solve a more complicated differential equation involving the use of 2 integrators, input of a function on the input table, and resultant solution in the form of a curve on the output table.